A ridged top chasse decorated with champleve enamel. On the front is a representation of the Martyrdom of St. Thomas of Becket . This shows the Saint standing by the altar while William de Tracy strikes him with his sword. Another knight, Richard Brito, comes behind and after him is Reginald Fitz Urse carrying his shining axe. On the top is the entombment of the Saint, a bishop stands over him and an attendant at either side. These panels are enclosed in wavy gilt and enamel borders. At the ends are full length figures of Saints. All the figures have their faces in relief and are in metal, finely engraved and gilt on a blue enamel ground. 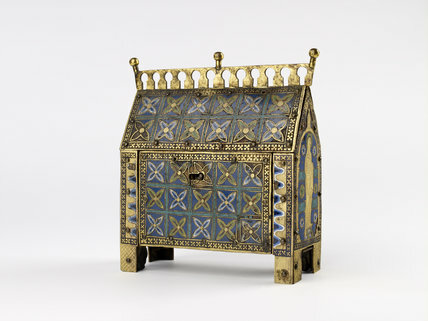 The back has square compartments of enamel quatrefoils on a blue ground, enclosed in narrow borders of small gilt crosses on black.